Mandolins are fun to play, but they’re a pain in the you-know-what to tune. Because the double strings are like quarreling siblings who never seem to agree with each other. Nonetheless, in this easy article, I will show you how to get your mandolin more or less in tune. As you already know, your mandolin has four pairs of strings. Each pair is tuned to the same note. Hold the mandolin on your lap in playing position. The 1st string is the one closest to the floor and is an E. Here are the names of the other notes. Tuning the Mandolin to Itself. 1) Adjust the 1st or E strings so they are in tune to each other. 2) Put your left index finger on the 2nd or A string of the mandolin at the 7th fret and make that string sound the same as the 1st string played “open” or unfretted. 3) Put your left index finger on the 3rd or D string at the seventh fret, and tune that string so it sounds the same as the 2nd or A string played open. 4) Finally, put your left index finger on the 4th or G string at the seventh fret, and make that string sound the same as the 3rd string played open. Important Tuning Tip: Always play a string before you begin turning a tuning peg, That way, you’ll know if you’re turning the correct peg in the right direction. Tuning to a Guitar: The E string on the guitar is the same as the 1st or E string on a mandolin. The third string at the 2nd fret of the guitar matches the 2nd or A string of the mandolin. The 4th string on the guitar matches the D or 3rd string on the mandolin. The 3rd string of the guitar is the same as the 4th string of the mandolin. Before you tune to a guitar, first make sure it’s in tune. Electronic Tuners: These little jewels are worth their weight in gold to a mandolin player. Before you fire up your electronic tuner, you should get your mandolin roughly in the ballpark, using the instructions above on tuning the mandolin to itself or tuning to a guitar. Electronic tuners are best used to fine tune your instrument. Now that you’ve got your mandolin more or less in tune, you might need some help learning to play it. 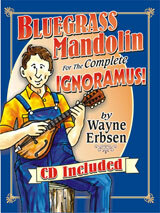 I’d like to suggest my book, Bluegrass Mandolin for the Complete Ignoramus! This book teaches you everything you need to know, from how to hold your pick, to picking out tunes, playing simple chords, learning twenty-eight bluegrass standards and being able to start jamming on the mandolin. 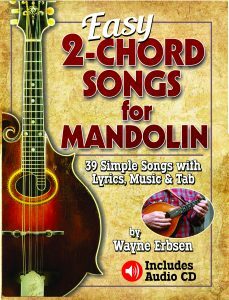 NEW- My newest mandolin instruction book for beginners just rolled off the press: Easy 2-Chord Songs for Mandolin. It’s as easy as a book gets, because each song only has TWO CHORDS. Learn dozens of classic bluegrass, gospel and folk songs, as well as how to pick out and hold a mandolin and more! Ur tuning instructions also hold good for indian classic music. The instructions r lucid. So must be ur book too. Good luck. I was using the standard tuning and didnt like it. Wow it sounded just like him and now im staying with this tuning. I could not figure out how to get my elect. Guitar tuner to tune my Mandolin, but now I understand; well somewhat. Info works great; made me feel a little dumb, but I’m new at it. Thanks, I really appreciate the help. Native of beautiful Asheville N C, Land of the Sky. Mountain boy being held against his will in mosquito infested Florida swamps w/ no help in sight. Aw! such is life. Simplicity at it’s best! Thank you and God bless you! Got it thanks. Hey wait. Isn’t it just the top four guitar strings upside down? Why didn’t I see it before?! Are they tuned in unison or octave?